I feel like I have spent a lot of time in recent months cursing the darkness. My Twitter and Facebook feeds are filled with vitriol, and occasionally, I find myself drawn into that type of thinking. I want to scream (post in ALL CAPS) about all the things, ideas, and people that are wrong, but I don’t think that’s where Jesus calls us to be. “I came so that they could have life,” Jesus says, “indeed, so that they could live life to the fullest,” (John 10:10), but this type of thinking/tweeting/posting/screaming feels life depleting. It is joy-sapping, pull-the-covers-over-your-head-until-the-storm-passes debilitating. 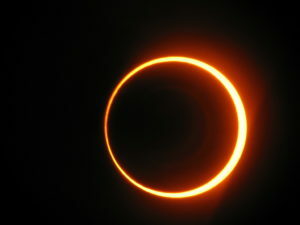 On August 21, the continental US will experience a solar eclipse. We, Jesus’s followers are to be the light of the world. 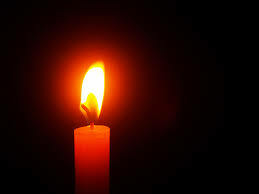 We are called to light a candle rather than curse the darkness, as the old quote says. We are acolytes, bearers of his light, even especially when the light appears to be almost gone. Today in Nashville (and many other places in the US), the sun is going to be obscured in the middle of the day, but it isn’t going anywhere. It is going to get dark, but the light will return. This whole eclipse thing seems like a pretty good image for people of faith today. There are obstructions to the light casting a shadow on society, but the source of light remains. 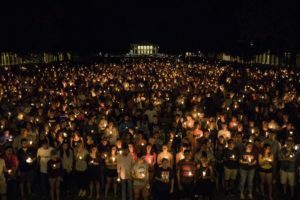 In the midst of the darkness, we ought to live as people light. an eclipse devotion about this here. 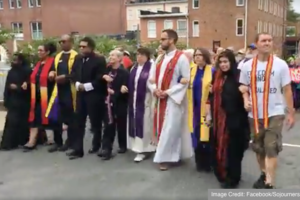 Clergy marched in peaceful protest in Charlottesville, VA. So then, if anyone is in Christ, that person is part of the new creation. The old things have gone away, and look, new things have arrived! through Christ and who gave us the ministry of reconciliation. Those who are in Christ, have been transformed to be part of new creation, to live in the age to come. We do that now as we participate in God’s light-bearing work of reconciling the world to him. That doesn’t mean that we don’t get angry—see Jason Micheli’s post “Angry Like Jesus”—but it does mean we don’t let the anger cause us to sin (Ephesians 4:26, Psalm 4:4). We don’t employ the methods of darkness. Instead, we shine the life-giving, life-affirming, eternal light of Jesus. So we go to dark places and stand up for justice. I am so proud of my clergy colleagues who were part of the counter-protest in Charlottesville, VA last weekend. That was a witness to new creation. We are called to also shine the light of reconciliation in our churches, workplaces, schools, neighborhoods, families, and everyplace else we go. Later in the chapter, Paul says that he and his posse are ambassadors who represent Christ through whom God is inviting everyone into this new creation. Fellow Bible nerds: Scholars argue that the word normally translated reconcile in this passage, is more about initiating friendship than agreeing to terms. See this. The world appears pretty dark right now. It feels natural to curse the darkness, to add my voice to the cacophony of criticism. But I am to be an ambassador of Jesus, a light-bearer, a living invitation to new creation. Let us bring our light together and join God’s life-giving work of transforming the world.